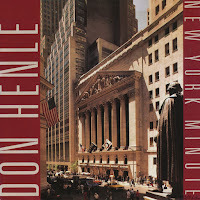 Don Henley recorded 'New York minute' for his 1989 album 'The end of the innocence'. It was released as the album's second single and reached number 48 in the US Billboard Hot 100 chart. The song was covered by the Eagles on the album 'Hell freezes over' reunion album (1994). As has become obvious to me, this blog is not only viewed by friendly people. Sometimes a prick comes along. The prick in question commented on my earlier entry on Don Henley's 'The boys of summer', suggesting that the info in that posting was not correct and that I should 'do [my] homework'. I wonder if a person like that would be able to come up with an active blog like this. 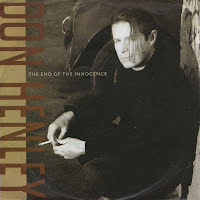 Fortunately for him, there's not much information about 'The end of the innocence', also by Don Henley. All I can say about it is that it was produced by Henley and Bruce Hornsby, with the latter also playing piano on this track. And to me the fascinating thing is that the beauty and excellence of the A-side of this single is matched by the horrible horribleness of the B-side. The title of this 1985 hit single is taken from the 1972 non-fiction book, 'The boys of summer' by Roger Kahn. Kahn's 'boys of summer' are the 1952 Brooklyn Dodgers, a team that Kahn covered as a sportswriter for the New York Herald Tribune. The book is about how the lives of the former ballplayers had changed between the time he covered the team and the time he tracked each of them down twenty years later. 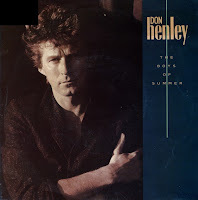 The lyric of Henley's song, which is driven by synthesizers and a LinnDrum, appears to be about the passing of youth and entering middle age, with the obvious theme of 'summer love' apparent in the choruses. In an interview, Henley explained that the song is more about aging and questioning the past, which is a recurring theme in Henley's lyrics.